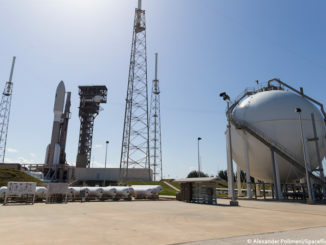 Launch of the Cygnus spacecraft atop an Atlas 5 rocket had been planned for Monday, but late in the day Wednesday, United Launch Alliance announced a delay pending resolution of an unspecified problem with the booster’s hydraulic system. SpaceX, meanwhile, is believed to be pressing ahead with launch of a SpaceX Falcon 9 rocket next Wednesday carrying a commercial communications satellite, the California rocket builder’s fourth flight this year and the first launch of a “used” first stage recovered after an earlier mission. But NASA’s focus is on the space station, and a push to complete the three spacewalks and the launch and capture of the Cygnus cargo ship before three of the station’s six crew members return to Earth April 10 to close out a 173-day stay in space. Two fresh crew members are scheduled to take off from Kazakhstan on April 20. First up is a spacewalk Friday — U.S. EVA-40 — by Expedition 50 commander Shane Kimbrough and European Space Agency astronaut Thomas Pesquet to carry out a variety of tasks, including work to ready a docking tunnel known as pressurized mating adapter No. 3 for a weekend move from the Tranquility module to the upper port of the forward Harmony module. Late this year or early next, a new docking mechanism will be attached to PMA-3, providing a second port for crews flying to the station aboard Boeing- and SpaceX-built commercial crew ferry ships. Kimbrough and Pesquet also will lubricate a robot arm grapple mechanism and install an upgraded control unit in the station’s power truss that can accommodate software commanding needed for commercial crew ships. Pesquet also will inspect part of the station’s ammonia coolant system to help engineers pinpoint and characterize a small leak. On Sunday, flight controllers at the Johnson Space Center in Houston will remotely operate the lab’s robot arm, detaching PMA-3 from the outboard port of the Tranquility module, which extends to the left of the station’s central Unity module, and moving it to Harmony’s upper port. 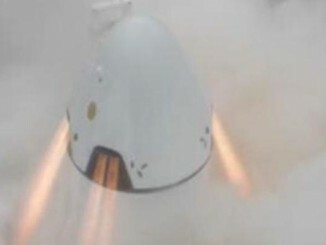 Harmony already features a docking tunnel extending from the module’s forward port, the same pressurized mating adapter once used by visiting space shuttles. That PMA now features a new docking mechanism designed for the Boeing and SpaceX crew capsules and after PMA-3 is in place atop Harmony, a second docking adapter eventually will be attached to give the station two crew docking ports. The U.S. segment of the lab already features two ports used by unpiloted cargo ships, one extending down from Harmony and the other extending down from Unity. The Russian segment of the station features five docking ports. NASA originally hoped to launch the Cygnus supply ship this past Sunday, but problems with a pad hydraulic system pushed the flight to Monday. Late Wednesday, a second hydraulic issue was identified, this one with the booster, and the launch was put on hold. A new launch date is not yet known. But the flight now will slip behind the launch of an SES communications satellite atop a SpaceX Falcon 9 rocket, which is believed to be scheduled for liftoff at 4:59 p.m. EDT on March 29. 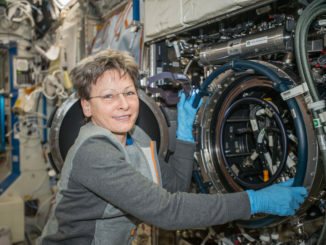 The next day, on March 30, Kimbrough and Peggy Whitson plan to stage a second spacewalk — U.S. EVA-41 — to connect power and data cables between PMA-3 and Harmony, to install micrometeoroid shields to protect the mating adapter and the Tranquility port where it had been attached and to install a second upgraded controller. 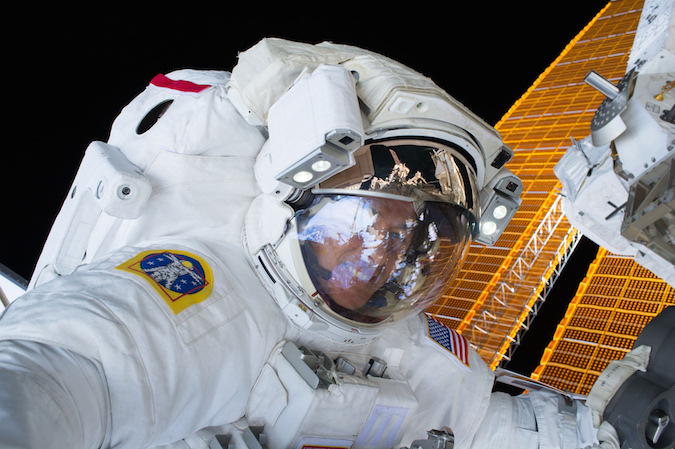 The third spacewalk, by Whitson and Pesquet, currently is planned for April 6. But EVA-42 will depend on when the Cygnus cargo ship arrives. The supply craft is carrying a cable needed to help engineers test a data circuit in a high-energy physics experiment and a replacement avionics box needed to support experiments mounted on an external stowage platform. Assuming the Cygnus gets there in time and the spacewalk stays on schedule, Whitson and Pesquet will replace the avionics box, install a wireless antenna and a new HD television camera and help engineers troubleshoot a cooling issue with the Alpha Magnetic Spectrometer. Whitson will install a jumper cable, launched aboard the Cygnus, to test a long-dormant data circuit in the instrument that could be used in the future if new coolant-system pumps need to be installed. She also will take additional photographs to help engineers assess the condition of the AMS’s thermal insulation. If the Cygnus does not arrive in time, the third spacewalk likely will be delayed to late April, sources say, but no decisions are expected until the problem with the Atlas 5 is resolved. Whenever it occurs, EVA-42, will be the 200th devoted to station assembly and maintenance since construction of the lab complex began in 1998. Some 125 astronauts and cosmonauts have worked outside the station over the years, logging more than 51 days of EVA time. Assuming all three spacewalks last the predicted six-and-a-half hours each, Whitson will move up to third on the list of the world’s most experienced spacewalkers, with nine excursions totaling more than 65 hours. Cosmonaut Anatoly Solovyev holds the record with 68 hours and 44 minutes of EVA time over 14 spacewalks, followed by former astronaut Mike Lopez-Alegria, whose total stands at 67 hours and 40 minutes over 10 EVAs. With all three spacewalks complete and Cygnus safely attached, Kimbrough, Soyuz MS-02 commander Sergey Ryzhikov and flight engineer Andrey Borisenko plan to undock and return to Earth April 10, landing on the steppe of Kazakhstan around 7:20 a.m. (5:20 p.m. local time). Whitson will take over as commander of Expedition 51 when Kimbrough departs. She and her two Soyuz MS-03 crewmates — Pesquet and Soyuz commander Oleg Novitskiy — will have the station to themselves until April 20 when Soyuz MS-04 commander Fyodor Yurchikhin and NASA flight engineer Jack Fischer arrive after launch from the Baikonur Cosmodrome. Soyuz ferry ships normally carry three crew members, but the Russians are dropping back to two for this flight to save money and reduce the need for supplies. As it now stands, Whitson, Pesquet and Novitskiy plan to return to Earth June 2. But mission managers are debating the possibility of keeping Whitson in orbit until September to maximize research time. If Whitson comes home on schedule in June, launch of the next SpaceX Dragon cargo ship, currently expected in mid May, likely will be delayed to August. With just two crew members — Fischer and Yurchikhin — aboard the station in June and most of July, the research gear scheduled for launch aboard the Dragon will not be needed until later in the summer, after three more crew members arrive in late July aboard the Soyuz MS-05 spacecraft. A decision on Whitson’s mission is expected soon.